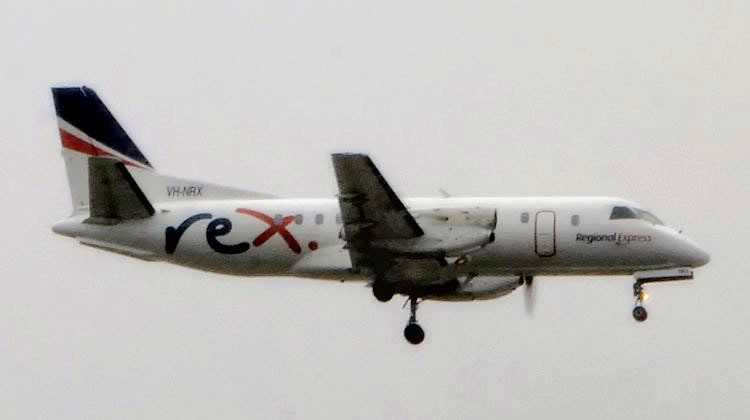 The Australian Transport Safety Bureau (ATSB) has opened an investigation into the loss of a propeller during a Regional Express (Rex) flight from Albury to Sydney. Saab 340B VH-NRX was operating flight ZL768 on Friday when the right propeller became separated from the engine about 19km from Sydney. The aircraft was carrying 16 passengers and three crew and landed safely with all on board unharmed. Rex said the crew “followed standard operating procedures and the aircraft landed normally and on-time at Sydney Airport”. “The 16 passengers and three crew members were met by Rex staff upon arrival and did not require any further assistance,” Rex said in a statement. The incident occurred just before 1200 local time. The ATSB said it had deployed three investigators with expertise in materials failure engineering, recorded flight data analysis and human factors to the scene. It called on anyone who finds the missing propeller to contact the ATSB or local police. “It is reported that the right propeller assembly detached in-flight during the Regional Express (REX) flight from Albury to Sydney,” the ATSB said in a statement. “Over the next few days, investigators will examine the aircraft, interview the flight and cabin crew, collect maintenance records and recorded flight data. Well at least it didn’t need feathering! Is there really an SOP for losing a prop though? Not speculating on the cause of this, but aren’t these planes pretty old? Maybe time to think of longer term replacement with ATR’s. Separation is a way better outcome than the prop running to the low pitch stop and causing huge amounts of drag. On older prop aircraft one of the ways of dealing with an overspeeding prop was to have the F/E shut off the oil supply and wait until the reduction gearbox seized and the prop sheared off. Much less drag that way. Another incident today. Time they took a look at maintenance practices in Wagga. I think they recently changed management down there?